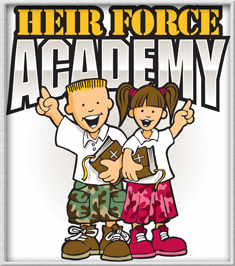 Heir Force Academy preschool is located on the campus of Kern Christian Center. This beautiful, new 7,000 square foot facility is equipped with state of the art technology while still providing a loving and nurturing environment for your preschooler. Once your child is enrolled in our preschool, the parent has the ability to log onto a secure website and observe their child in the classroom setting. You can feel secure leaving your child with our trained staff that will loving care for and teach your child in an enriching environment.